Long gone is the era when dahlias were distinctly passé. For the last ten years or more, dahlias have undergone a huge resurgence in popularity, mostly attributed to the incredibly successful ‘Bishop’ series with their dense dark red foliage. The most popular of these is Bishop of Llandaff but, due to a number of mishaps, we don’t have any of these outside the back door. 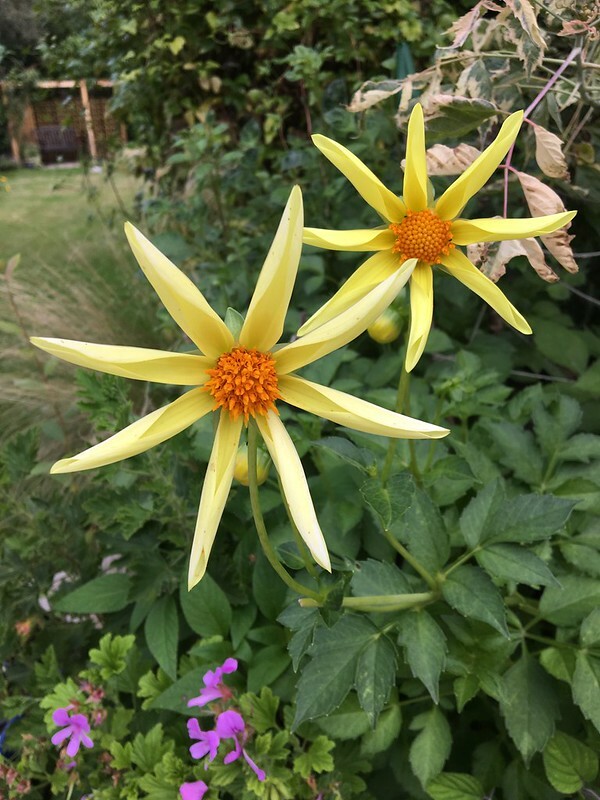 We do, however, have some fellow Bishops – notably Oxford and Canterbury, the result of a newspaper offer on Bishop dahlias that we sent off for some years ago. Initially we kept our dahlias in pots. This was based on our bad experiences with the Bishop of Llandaff, one of which drowned on the patio in a very wet spring, and another of which was eaten to death in the border. Pots seemed a safer option, added to which we could enjoy the flowers close to the house. We also didn’t really have the right sort of space in the border for planting them out. However, with the advent of my new hot / late summer border, that has all changed. Much of the appeal of dahlias is their ability to extend the season. For the first years that we lived here, I joined the ranks of frustrated gardeners who despair in August as the beautiful flower border of May and June is transformed into a rather desolate flower-less sight. I know that there’s nothing wrong with green and I relish our evergreens in view in the depths of winter, but in July, August and September, I want something a bit more vibrant! So, with the new border in place, our Bishops were released from the confinement of their pots and, goodness me, have they taken advantage! At one point in the middle of August I counted no less than 19 flowers in full bloom on our Oxfords. 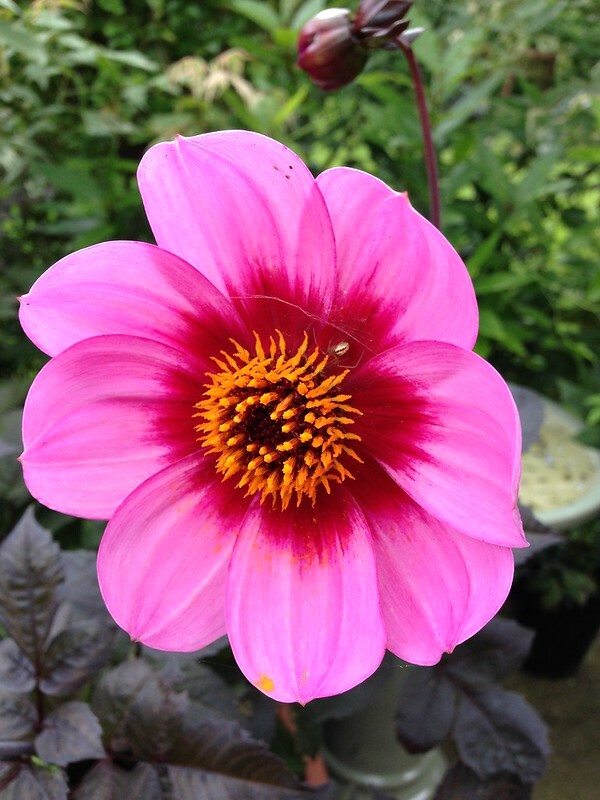 Having got into dahlias via the dark-leaved varieties, we have gradually become more adventurous in our choices, realising that it’s not so much about the leaf colour as the flower shape and that there are many, many different flower shapes, some of which will appeal more than others. I cannot, for example, imagine us suddenly developing a liking for pom-pom dahlias! They are just not our cup of tea. 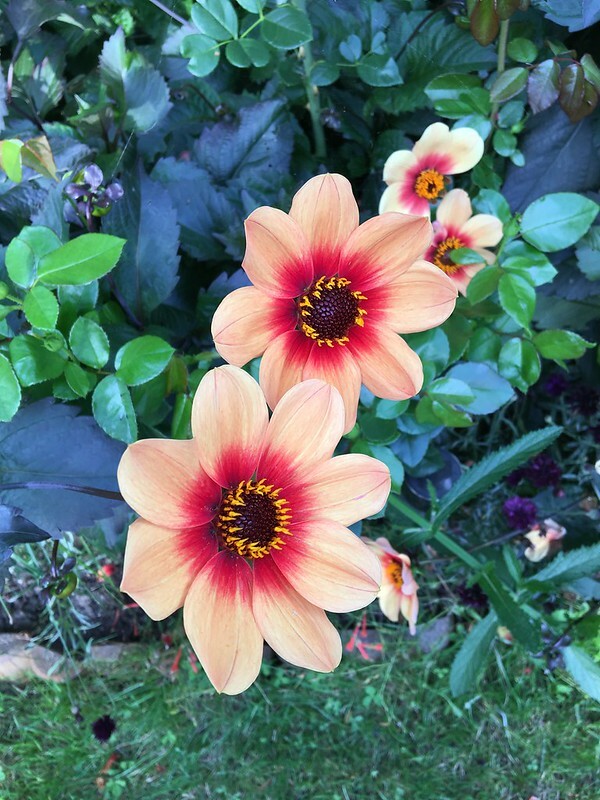 Star-shaped dahlias, however, we love and are particularly pleased with ‘Verrone’s Obsidian’ which produces extremely dark red flowers that are almost black and which beautifully complement the orange of the Oxfords. The star-shaped flowers have much sharper, linear petals whereas the Bishops tend to have much smaller, rounded petals but both are very much single flowers with wide open centres which are a magnet for bees. Into this mix come our Honkas! Another star dahlia, we have both red and yellow varieties. The yellows are just such a happy flower, shining like sunrays even on the gloomiest summer day. The reds are incredibly rich in colour. 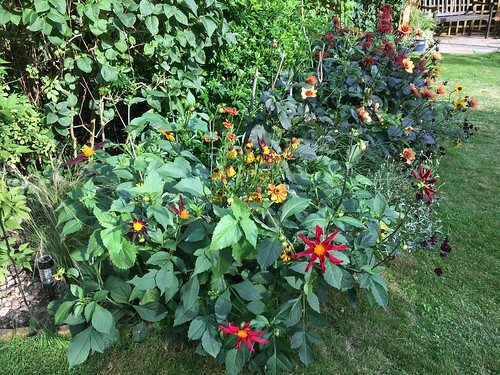 I really felt that I had achieved what I set out to do when, on the August bank holiday weekend, a friend remarked on the amount of colour we had in the garden. Although the main part of the border still had some pretty pink, purples and whites, it was the new hot border with the dahlias that was positively zinging and affirming that it wasn’t autumn just yet. I am now keeping my fingers crossed that we don’t have an early frost as it would be incredibly sad to see this display reduced to a heap of blackened leaves just yet. Meanwhile we face the dilemma – to lift, or not to lift? I would say that we live in a mild area and the gardening books and websites suggest that a thick layer of mulch is therefore all we need to keep our dahlias cosy until next Spring. But we’ve not done that before and have preferred to lift them, dust down and dry off and we have still lost some tubers. So it’s going to be a difficult decision but, one thing is for certain, I don’t intend to be without dahlias next summer! 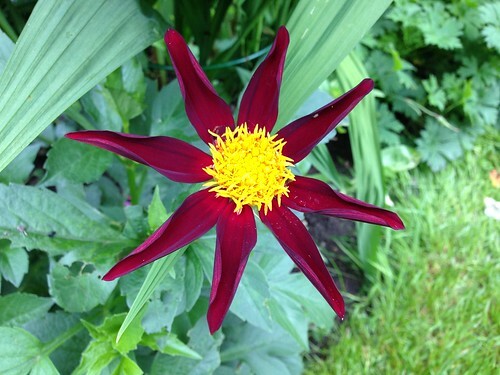 Categories: Blog post | Tags: Dahlias, Hot border | Permalink. Laura is a bit of a star! Laura is our crab apple tree and, no, we have not named her! Laura is simply the variety … but it has caused confusion on a number of occasions! 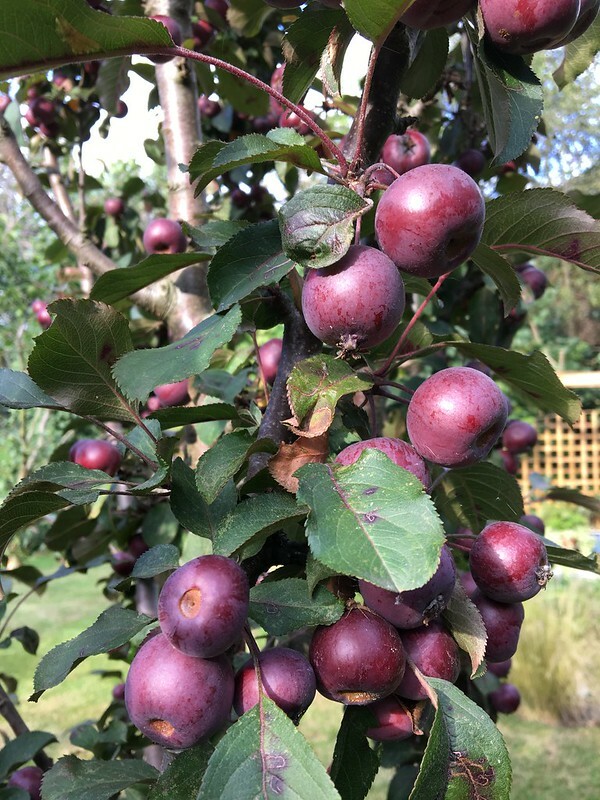 We chose and planted Laura about 8 years ago having been inspired to plant a crab apple tree by a friend’s jelly made from the very popular John Downie crab apple. We weren’t entirely sure if we wanted to make jelly and we were also concerned that at John Downie could get too big in our garden. So we decided to research alternative varieties. 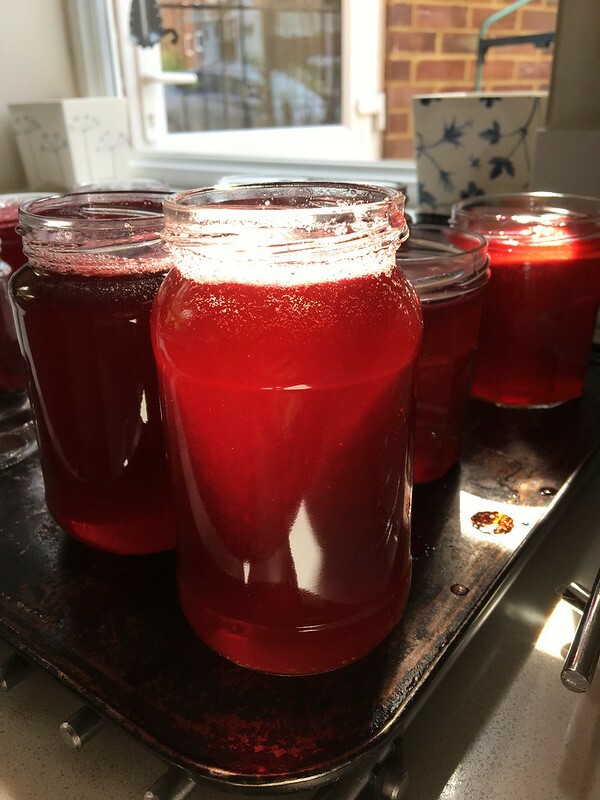 We wanted to keep our options open with regards to the jelly making but we also wanted attractive blossom in the spring and ideally autumn colour – not much then! For jelly making, you need to plant a variety that will produce sensible sized fruits. You cannot, for example, easily make jelly from a tree that produces crab apples the size of a grape! When we discovered Laura, she sounded perfect with dark red fruits about the size of a ping-pong ball. The lovely thing about dark red fruits is that you also get dark red jelly! Laura has really flourished and every spring we enjoy her stunning deep pink and white flushed blossom and summer by summer she is getting more and more prolific so that we are literally picking bucket-loads of fruit! Of all the trees in our garden, I think it would be fair to say that it is Laura that gives us most pleasure. We enjoy looking at her, we enjoy eating the end product, and she has been a very easy plant to care for with just a little pruning required to keep her in tip-top shape and to ensure she continues to fruit well. Should you be inspired to acquire Laura for yourself, she’s not easy to track down but a quick Google search shows that she is currently available from Ken Muir and Pomona Fruits amongst others. 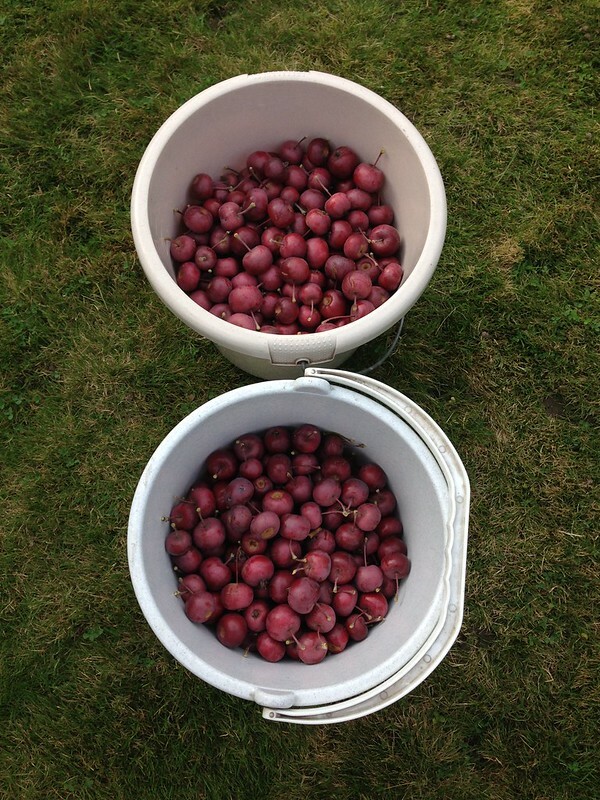 Categories: Blog post | Tags: Crab apples, Fruit, Jelly, Laura | Permalink.